The Synod of Bishops will undergo changes so that it can be “a real and effective instrument of communion which through the collegiality called for by the Second Vatican Council is expressed and realized,” the secretary-general of the Synod told a November 5 press conference. Don’t you just love how the archbishop tossed in a little Latin so as to lend an air of tradition to the utterly untraditional concept of a democratized Church? The reform in the Synod, the archbishop said, will involve changes “of both a structural and methodological nature.” While he did not provide details of the Pope’s plans, he said that the Holy Father is determined to enhance the role of the Synod as a means of giving the world’s bishops an active voice in establishing priorities and setting policies for the universal Church. I’m going to go way out on a limb here and say that the reform of the Roman Curia will involve making the Synod an official part of the Curia; the Congregation for Collegiality, perhaps. Oh, and the papal tiara isn’t coming off the shelf any time soon. Since you emphasize kingship on your site, you should make a study of St. Thomas’s “On Kingship”, if you haven’t. If we aren’t racing towards the end, restoration after this reasonably could take centuries. Comparably minor hiccups took decades and centuries, and the efforts of great saints, to recover from in the past. We must make the CENTER of our lives the imploring of God, through continual prayer and sacrifice, to turn off His anger from us and to rescue His people. Lord, thou hast blessed thy land: thou hast turned away the captivity of Jacob. Thou hast forgiven the iniquity of thy people: thou hast covered all their sins. Thou hast mitigated all thy anger: thou hast turned away from the wrath of thy indignation. Convert us, O God our saviour: and turn off thy anger from us. Wilt thou be angry with us for ever: or wilt thou extend thy wrath from generation to generation? Thou wilt turn, O God, and bring us to life: and thy people shall rejoice in thee. shew us, O Lord, thy mercy; and grant us thy salvation. I will hear what the Lord God will speak in me: for he will speak peace unto his people: And unto his saints: and unto them that are converted to the heart. Surely his salvation is near to them that fear him: that glory may dwell in our land. Mercy and truth have met each other: justice and peace have kissed. Truth is sprung out of the earth: and justice hath looked down from heaven. For the Lord will give goodness: and our earth shall yield her fruit. Justice shall walk before him: and shall set his steps in the way. Well, V2 VIPs have been sand-mining for decades now, siphoning off the deposits keeping the ocean floor in balance, we see now that they have shipped the sand to Rome and are pumping it beneath the pillars as we weep. But those who sow in tears, will reap in joy; Christ the King, the Conquerer, the Ruler, God Who is not mocked, is the cornerstone, the foundation stone, and He will not be moved. When the sand of the revolutionaries turns quick, to whom will they cry to pull them out? If they cry to the One True God, to ‘restore/recover/return them to’ the One True Faith, will He give them directions to the SSPX? If they’re lucky. Father William Welsh comments: “The First Vatican Council defined clearly that ‘The Roman Catholic Church is a monarchy. It is ‘not’ a democracy. And therefore there is no right for anyone to question, with episcopal conferences and pastoral councils, the authority of the monarch. And who is the monarch? And who are the princes of the Church who have become presidents, representatives of the people, figureheads? The bishops are the princes of the Church, they have always been the princes of the Church. But no one knows any longer what a prince is, so the people don’t know how to treat a prince, and these princes don’t know how to act like princes. And the pope? 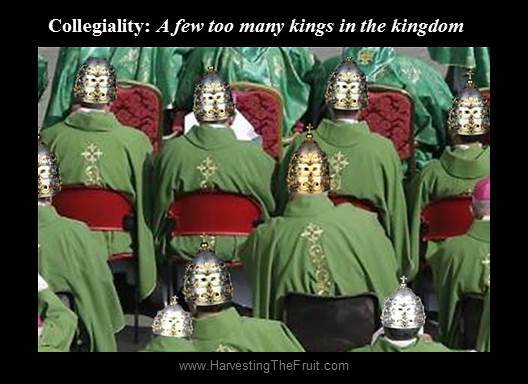 Does any one today in the Roman Catholic Church really know what the Holy Father is?………The Holy Father was taken from his throne, and WITH THE SPIRIT OF COLLEGIALITY HE WAS STRIPPED OF HIS SOVEREIGNTY AS A MONARCH. (“Art Thou a King Then?” – Catholic, Nov. 1990). Pope Gregory XVI: ……”All who seek to disturb this order in any way, shake, as far as in them lies, the constitution of the Church.” (Mirari vos). That’s so true. To be consecrated, ordained – made a unique and Holy different kind of man in Christ, means the flock are your sheep, they are not your peeps – but the shepherds these days want themselves and their consecrated peeps to be the sheeps. To shepherd is to stand over, watch over, feed, guide, with a crook – hence the Bishop’s Crosier; in the case of the Church, for the sake of sheep who belong to the King of Kings. But a casualness that clergy seem increasingly to need, even in Mass, shows the loss of the understanding of the sacrificial vocation they took on, and also, because of the trained (since V2) casualness of the flock, it’s an ever decreasing circle. The lack of vocations, the indifference of most men – the majority of Eucharistic ‘ministers’ are women. I do believe that because the role in the sanctuary is something Christ gave to men, men simply become indifferent if they see women doing something that, ‘before’, only they were given to do. God has given us distinct paths – the obsession with blurring to the point of destroying these purposeful and God-given paths is not of Holy Mother Church. And likewise, what can be done when a Pope accepts the path of Pope without wanting to accept the burden of the Pope? Louie, I beg to differ. I think that we have ’til no later than 2020 and up to 2015 for the Tiara to be dusted off and used to reorder the world. 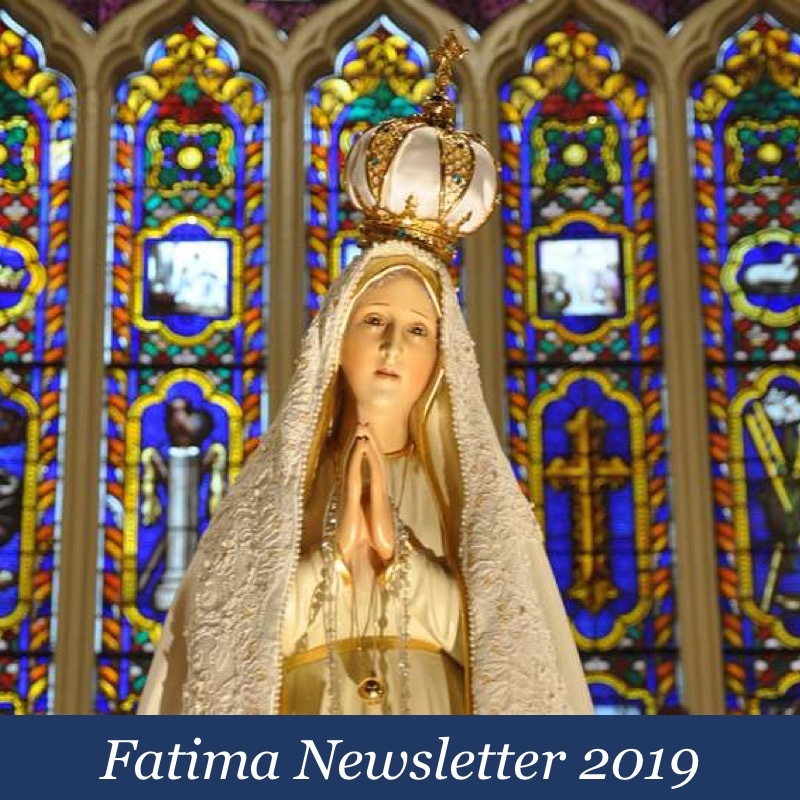 The 100th anniversary of Fatima is close approaching. Upon the 100th anniversary of Christ requesting the consecration of France to the Sacred Heart (through St. Margaret Mary – ignored) the French Revolution began. I have a hard time imagining that “The Days of Noah” could have even approached our times in evil and debauchery. Heck, I fear that I am so steeped in it that I can’t even looked at the world through objectively pure eyes. So I can’t even see how bad we’ve gotten. I think that everyone better offer up all that comes, because, like the Carmelites at Compiegn, it will be the only thing to end the next terror. And the Pope who guides us will wear the Tiara. Humility is knowing your place, and taking your place. The trappings of the Papacy are not for the benefit of the person of the Vicar of Christ, it is for the benefit of the sheepfold whom are being fed by the Vicar. The exalted appearance is to glorify God. If one is called who does not like tiaras or red slippers, then one must offer it up and accept them. They are part of the Cross. Many Saints held exalted positions, and wore hair-shirts beneath their finery. We all better accept our hair-shirts in reparation, and, even if we are not in Mortal Sin, we should regularly review how we ourselves are performing our duties according to our station in life. Know your place and take your place. Anything else is posturing. Paul said: ” The trappings of the Papacy are not for the benefit of the person of the Vicar of Christ, it is for the benefit of the sheepfold whom are being fed by the Vicar.” Christ wanted a visible Church. How much could God Almighty do for this satanically oriented world to keep the Light of Christ within it? Rome as the seat of St Peter is 2000 years old! Glowing in splendor through each Anno Domini of post-Resurrection history. 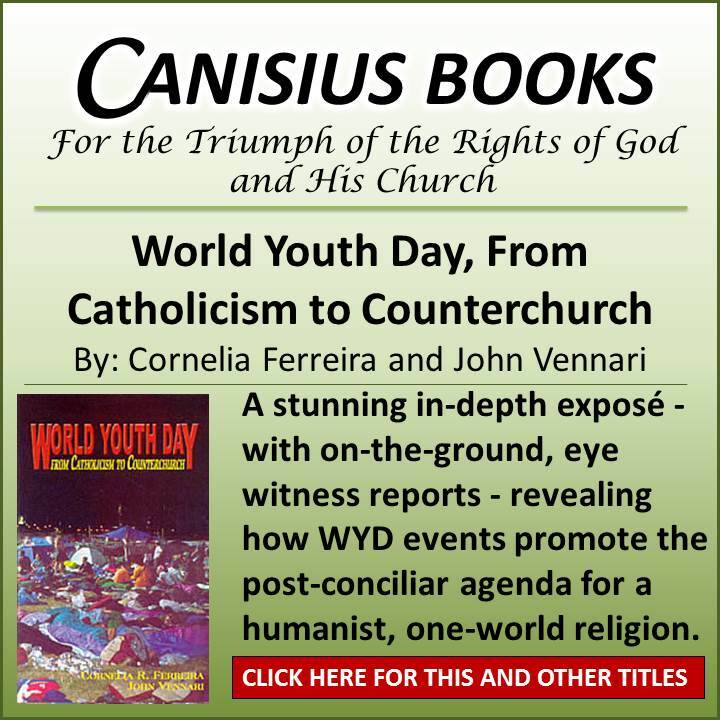 The Catholic Church evangelised the planet before most protesters were even being tempted by his gruesomeness. 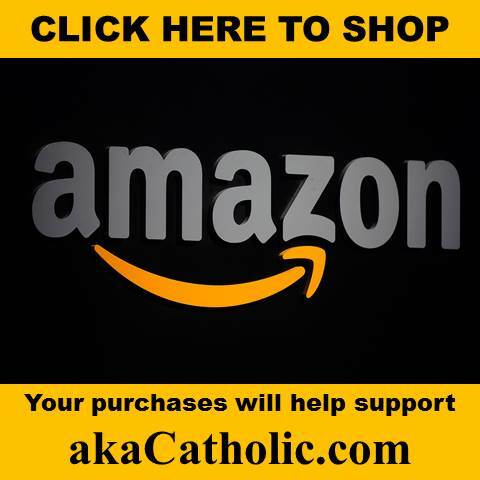 Catholic missionaries have been slaughtered, burned, ritually eaten, disappeared, tortured for years, and on goes the plethora of satanic hate-crimes against God and His Faithful – His own, preaching Him, as He commanded. We have the opportunity of attending the sacrifice of God the Son everyday for the washing away of our sins – but being that He is God, maybe attendance would be greater if the feasts were for the blood of the Martyrs – mortals – however much we might dismiss the reality of being called to shed our own blood in union with God’s. There are Christian Martyrs around the world, thanks to islam, who get the opportunity everyday. But, as PF implied, Benedict XVI set that concorde with the father of lies back…who can say how many Martyrs? Collegiality is not the same as Apostolic Succession. Once again, the Church powers that be seem to confuse the horizontal arm from the vertical arm of the Cross. Awesome comment. You hit the nail on the head with your comments. St Thomas More too wore a hair-shirt beneath his fine clothes as Lord Chancellor. 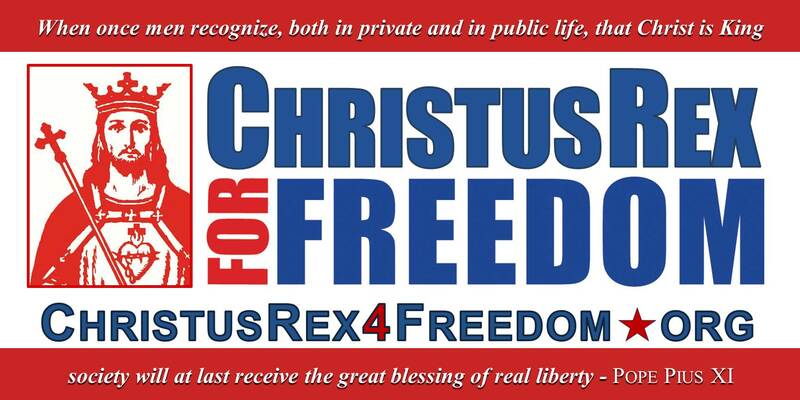 If only Bergoglio and other like-minded people would think like this. 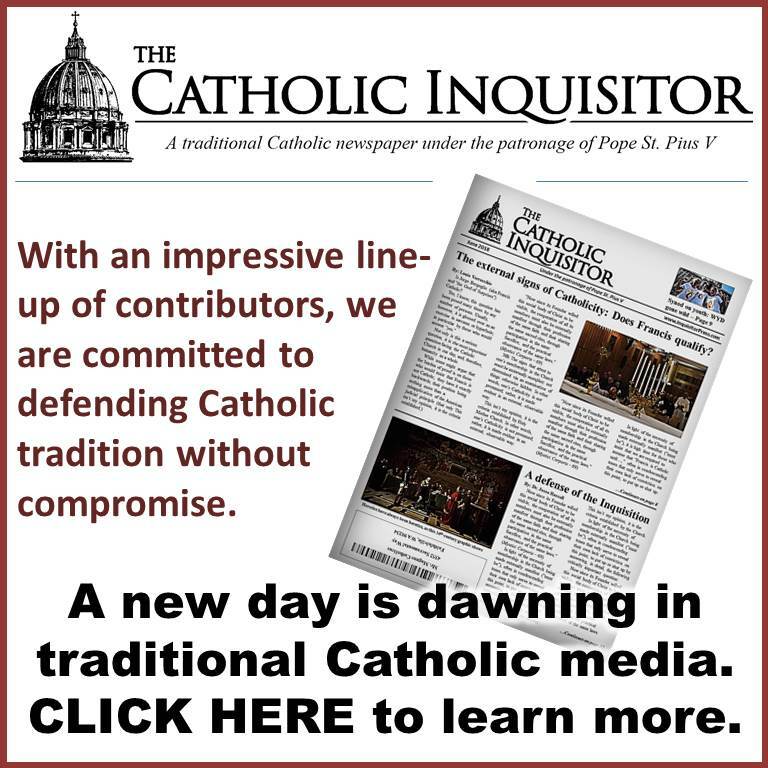 Satan’s stepchild, Modernism, is diligently striving to overthrow the Divinely-Constitued Authority on Earth and one way to do that is to destroy it by an ever-expanding (re)definition of Papacy (a collegiality that’ll result in the college of Bishops having primacy) and another way is to, conversely, trying shrink it to a Primus inter pares status so beloved by our modern Popes. 19. As Vicar of Him Who in a decisive hour pronounced before the highest earthly authority of that day, the great words: “For this was I born, and for this came I into the world; that I should give testimony to the truth. Every one that is of the truth, hearest My voice” (Saint John xviii. 37), We feel We owe no greater debt to Our office and to Our time than to testify to the truth with Apostolic firmness: “to give testimony to the truth.” This duty necessarily entails the exposition and confutation of errors and human faults; for these must be made known before it is possible to tend and to heal them. “You shall know the truth and the truth shall make you free” (Saint John viii. 32). 20. In the fulfillment of this, Our duty, we shall not let Ourselves be influenced by earthly considerations nor be held back by mistrust or opposition, by rebuffs or lack of appreciation of Our words, nor yet by fear of misconceptions and misinterpretations. We shall fulfill Our duty, animated ever with that paternal charity which, while it suffers from the evils which afflict Our children, at the same time points out to them the remedy; We shall strive to imitate the Divine Model of shepherds, Jesus, the Good Shepherd, Who is light as well as love: “Doing the truth in charity” (Ephesians iv. 15). Well stated. Thanks for this. Dear Halina. You quoted “But no one knows any longer what a prince is”. This is very true. Our culture is so indoctrinated by “democracy”. And yet when I go to work it is not a “democracy” nor is the family a “democracy” and even our “democratic form of government” is not a democracy. The overthrow of the monarchies by “democracies” was ultimately aimed at the overthrowing the monarchy of Christ the King. I spent some time in Thailand where the King is revered. I saw people literally kneel before royalty. When have you seen that? One day I was in Mass and we were kneeling before the Eucharist and it finally hit me that we were kneeling before Christ the King who was present. I had never felt the presence of Christ at Mass before and this was even before I understood that Christ was present in the Eucharist. All I knew at that time was that I felt the presence of Christ and that He was my King. In all of the multi-culturalism that the NewChurch professes do you think that they will give emphasis to Christ the King in cultures that still have reverence for their King? No, it does not fit their egalitarian humanist agenda. So much for multi-culturalism. So much for diversity. So much for tolerance. And on and on, blah-blah-blah. Ad Hoc arguments rule the day. Indeed, the Pope is a monarch. It’s his right to judge, also, and yet he says “who am I to judge”? I don’t even know what it’s like to see the Pope wearing the Papal Tiara. I long for the day when it’s taken up again at the coming restoration of the Church. “But no one knows any longer what a prince is”…..How true. Growing up in Poland, we had a high respect for our priest……. “Praised Be Our Lord and Saviour”……was how the priest was greeted. Till today it is still how the faithful show respect. In this country the priests are ashamed of wearing the habit……….they pass by you, in disguise…….dressed as one of the guys. This is how the world passes by the Catholic Church…….not knowing, that Jesus Christ is amongst us………in the Tabernacle, even Catholics barely bend their knee, nor do tBut no one knows any longer what a prince is”.hey ‘bow’. But no one knows any longer what a prince is”. As children we were taught by our good priests, that when you pass by the Church, you must make the ‘sign of the cross’. I teach the same my sons……and tell all, who do not know. The root cause of our difficulties in these ‘grave times’ is the worst example of the hierarchy, who is ashamed to preach from the pulpit, from the rooftops……. that Jesus Christ is the King!….that…. ‘All kings shall pay Him homage’ all nations shall serve Him……’For God is the King of all the earth…..and He shall have dominion over the nations!……All nations. All Kings. All peoples. All Governments! That always and everywhere all are subject to His rule, His doctrine, His Church! IS THERE A WONDER, THAT THE WORLD REJECTS HIM! …….Miserere! …..sorry……the devil was messing up with my typing……. How’s this: Modernism is an ideology that defies objective reality. Close, but I disagree. “Logic” is a more precise term. Pius X warns against an immanence that verges on pantheism/ an illogical reasoning that there are no distincitions between an individual and what is beyond him. And, that both are evolving to adapt to epochal changes, etc. Let us all just remember that Our Lord’s Mystical Body, the Church, MUST in some manner mirror His own most holy life. The spreading of the Church and its influence was indeed much like His preaching the Gospel throughout Palestine. The great Age of Faith may be likened to His triumphal entry into Jerusalem. But the beginning of His Sacred Passion was hatched from right within His chosen and divinely called circle, and ignited in the midst of His establishing of the most holy action of the Mass. Judas was a called Apostle. O, the scandal of the Cross! Almost everyone failed Him. His chosen vicar denied Him. And all who remained could merely suffer with Him at the foot of the Cross. This ALL must come to pass in the Church as well, so that we may be perfectly conformed to Christ. The Resurrection did not come about by fighting and planning or struggle. It happened because He arose by His own power, and came to restore, uplift, console and deliver from grief the ones who, to a greater or lesser degree, were waiting for thier divine Master to DO something, albeit they did not know exactly what, perhaps. Let us likewise be content to suffer with our Master; to do the work that is in front of us (blessed are they who when he returns he shall find waiting); to pray for the grace of perseverance, keep the Faith, and hold until relieved.